The Auditorium in San Lorenzo de El Escorial, in collaboration with National Heritage, offer the opportunity to visit the real scenarios in the life of the opera characters in an unique way. Go through the real scenarios of Don Carlo guided by the infante Don John of Austria. 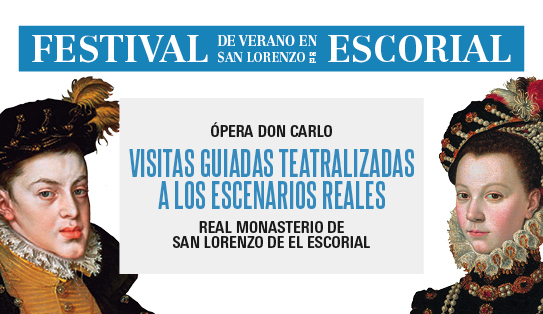 Guided tours of the Royal Monastery of San Lorenzo de El Escorial before the performance of Don Carlo. Enjoying Don Carlo in El Escorial is a one-of-a-kind experience. In order to make an extraordinary occasion out of it, the Auditorium in San Lorenzo de El Escorial, in collaboration with National Heritage, offer the opportunity to visit the real scenarios in the life of the opera characters in a unique way. On July the 25th and 29th, prior to the performance, there will be a guided tour led by an actor portraying Don John of Austria. We will be able to reenact some of the play’s scenarios and to get to know the opera characters, as well as the History of Spain as told by one of their protagonists. The visit will conclude with a glass of cava on the terrace of the Auditorium, from where you can see some of the best views of the mountains and the city of Madrid. – The Royal Mausoleum, built by Juan Gómez de Mora according to the plans by Juan Bautista Crescenzi. It consists of 26 marble tombs that contain the mortal remains of Spain’s kings and queens of the Houses of Habsburg and Bourbon, except from the kings Philip V and Ferdinand VI. – The Infantes’ Mausoleum, located in the same level as the Royal Mausoleum, but under the convent area. Finished in 1888, it’s destined to be the tomb of princes, infants and queens that have not been kings’ mothers. With white marble walls and pavements, it’s worth mentioning the sepulcher of John of Austria, designed by Ponciano Ponzano and built by Giuseppe Galeotti. It is currently occupied in 36 out of its 60 niches. – The Royal Library of El Escorial, also known as the Escurialense or the Laurentina; a grand library from the Spanish Renaissance founded by Philip II. It holds a vast fund of important literary volumes, as well as other collections, such as engravings, drawings, music, documents, hagiographic archives, coins and medals, or bindings. The guided visits will be held twice per day: at 18:00h and 18:45h on the 25th and 29th of July. At each of these times there will be three groups with a maximum of 35 people per group. *Those assisting the visits must be at the door of the Basilica of the Royal Monastery of San Lorenzo de El Escorial 15 minutes before the beginning of the tour; where the guides will be awaiting. *Were you interested in making the tour; we recommend you to book in advance, as there is a limited capacity. Theatre’s Box Office. From June 16th, Tuesday to Sunday and Mondays 27th of July and 3rd of August, from 12:00 to 14:00 and from 17:30 to 20:30h. Box Office at the Teatros del Canal (Cea Bermúdez, 1, Madrid – Tel. 91 308 99 99): Up until July 3rd from 14:30 to 21:00h.